The use of bad flowing products can often lead to various issues : extraction under silos, dosing accuracy and feeding during material transfer. TIM provides you an original and simple equipment, the TRANSITUBE anti-bridging unit ZFP type. 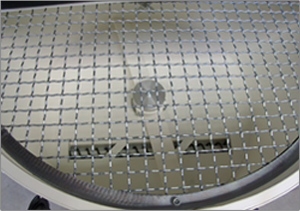 The TRANSITUBE anti-bridging unit ZFP type is a flat bottom hopper specially adapted for bad flowing products with low density, like regrind of film or sheets, filler, CaCo3 or plastified PVC. The extracting duct of the anti-bridging unit allows to obtain a variable and adjustable dosing according to the required application. Connected to a TRANSITUBE flexible mechanical feeder PV type, the product is then transferred until final point. 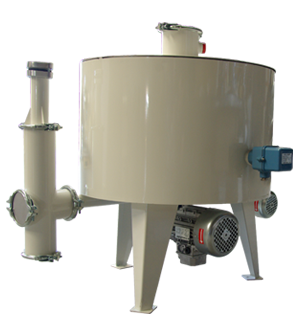 This unit has the possibility to be grouped with other dosers for the process of several products dosing. PThe TRANSITUBE anti-bridging unit ZFP type allows to carry extremely precise continuous dosing out : 0.5 to 3% depending on products nature. Of bad flowing products within a wide output range up to 6000 kh/h by coupling the application with a TRANSITUBE flexible mechanical feeder. The TRANSITUBE anti-bridging unit ZFP type can be integrated as a dosing unit within a metering units carousel. Working in combination with the TRANSITUBE flexible mechanical feeder, the anti-bridging and discharging device type ZFP has been designed to handle bulk material with proof low characteristics eliminating the risk of bridging. The feeding spiral in combination with the rotating blade guaranties a continuous conveying of all bridging materials. These can be additives in the plastics industry like calcium carbonate, or titanium dioxide, regrind with a tendency to bridging etc. This device is the optimal solution for handling almost all bulk materials in the food, pharmaceutical or chemical industry as well.